Do you want to improve the customer experience of your Contact Center? Most customers today prefer to self-service; they want to get their information through a knowledgebase, wiki page, or forum posts. Millennials have grown up accustomed to email and chat rather than telephone calls. Most millennial customers are going to contact customer service directly as a last resort. All of this means that your user experience can be improved vastly through the use of a chatbot. What Are the Advantages of a Chatbot? A chatbot has the ability to parse organic speech. Instead of the user having to search for “shipping times + Canada,” a user can instead ask the chatbot “How long does it take to ship a package to Canada?” The chatbot will “understand” that the user is asking for “shipping + Canada” and will attempt to answer the question just as a human service representative would. Chatbots are a cost-effective alternative to hiring more customer service representatives. They require virtually no cost to run. If they aren’t used, they aren’t a sunk cost in the way an employee would be. When they are used, they can deal with many customers at once. Traditionally, chatbots have just been text-based. But today, a customer service chatbot can even listen to, understand, and provide answers vocally. This offers a completely new dimension to customer support. This is tremendously advantageous, because the chatbot can answer rudimentary questions without the need for a paid customer service representative. If the chatbot cannot answer questions, it can still politely escalate to a real person. Chatbots are very scalable; not only do they provide a great customer experience, but they can also deal with 1,000 customers virtually as easily as 100 customers. Amazon Connect. Amazon Connect is Amazon’s self-service contact center product, which provides an all-in-one contact center for any organization. Small businesses and large enterprises can both utilize Amazon Connect, as the cost and services provided scale to the size of the customer. Amazon Polly. Amazon Polly is able to turn text into extremely human-like speech patterns. This is designed to provide for a better user experience for customer-based apps. Apps won’t just need to type out answers; they can actually talk directly to the customer. This is convenient for the customer as well, as they can talk to Amazon Polly while they are doing other things. Amazon Web Services. AWS provides data processing, bandwidth, and storage for business solutions. It is one of the largest services that Amazon offers today. Amazon Web Services can provide the server capabilities that are needed for an advanced chatbot system. As noted, things such as Amazon Lex are very complicated; they require an immense amount of processing due to their advanced algorithms. 80% of businesses plan to start using a chatbot in the next few years, with 36% already implementing them. Amazon has provided all of the tools your organization needs to create a superb chatbot for customer support Contact Center. 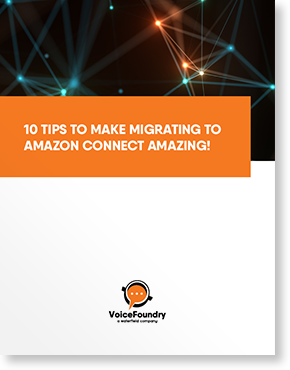 Through Amazon’s technologies, you can access best-in-class natural language processing, and the data and bandwidth capabilities needed to utilize it.